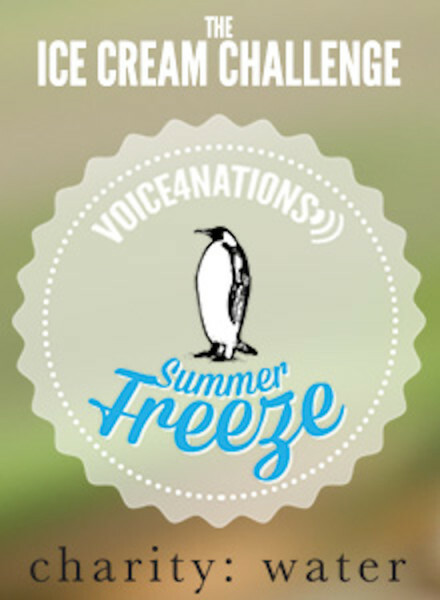 Voice4Nations.org, the non-profit outreach of virtual phone service company, VoiceNation, has kicked off their new Ice Cream Challenge Campaign, the “Summer Freeze”, which encourages folks to donate their ice cream money to help raise funds for clean water in developing nations. According to the International Dairy Foods Association, Americans spend tens of billions of dollars a year on ice cream. For the amount the average American household spends on ice cream every month, that same amount could provide clean drinking water for a year to someone without it. Through Voice4Nations’ new summer giving campaign, individuals and families can contribute to the Ice Cream Challenge, “Summer Freeze” Campaign on charity: water.org, in an effort to help save lives and rid diseases in developing nations. So far this year, Voice4Nations has raised over $1100, which will provide clean water for at least 55 people. To show your support and accept the Ice Cream Challenge, “Summer Freeze”, visit http://voice4nations.org/get-involved. Voice4Nations, the non-profit outreach of VoiceNation, acts as a voice for the nations – a voice for those who can’t speak for themselves, like the 50 percent of all children who live in poverty. Voice4Nations’ goal is to create awareness, encourage people to make a difference, and connect them with successful organizations where they can make a contribution directly funding the need. A new generation of Voice4Nations.org has been launched to address the organization’s three key initiatives: bullying prevention, the global water crisis, and homelessness.